What gospel song became a civil rights rallying cry? Recently, my pastor friend James posted a video clip on Facebook of his Massachusetts congregation singing “THIS LITTLE LIGHT OF MINE.” He accompanied on the guitar backed up by a small band, and a little child led them. In this case, the little child was his preschool grandson, singing in full voice (perfect pitch!) with single-focused gusto into the mic his mama held. “ALL AROUND THE WORLD, I’M GONNA LET IT SHINE!” I watched the clip over and over, wiping away tears for this child, his light ready to shine brightly in a world of chaotic darkness. We clap and sing the message as if we’re sure of ourselves, until we remember the nature of darkness, not so much fun after all. Letting our light shine is easier said than done when “shining” may expose us, bring unwanted attention, responsibility, or risk. We’re talking about courage here. 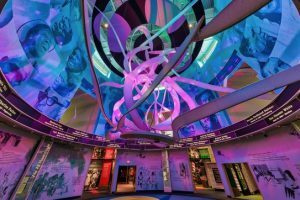 At the newly opened Mississippi Civil Rights Museum in Jackson, visitors move from gallery to gallery surrounded by displays showing the slave trade, atrocities of the Jim Crow era, images of lynching, mutilated bodies, burning crosses, white sheets, police dogs straining at their leashes. 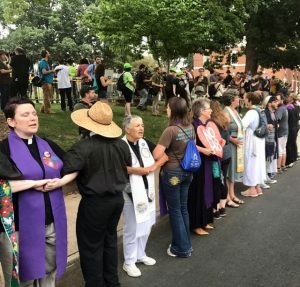 In August, 2017, Christian pastors, Jewish rabbis, and lay people of many faith traditions stood before armed white supremacist militia and sang “This Little Light of Mine.” It was a tense weekend in Virginia. Klansmen and other white nationalists assembled for a “Unite the Right” rally, marching around in Trump hats, giving Nazi salutes, and waving Confederate flags. Progressive people of faith linked arms, prayed for courage, and sang this song to remind themselves of their individual responsibility. Whose gonna let it shine? “I’m gonna let it shine.” Who? I am. I am! Does it matter that no one is quite sure where this melody and lyrics came from? Many song collections credit it as an African-American spiritual or a traditional folksong. It has that feel. 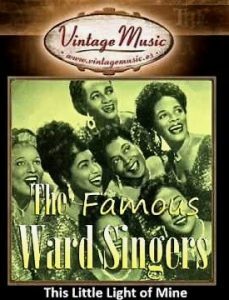 In the 1950s, the Ward Singers, an all-female African-American gospel ensemble led by Clara Ward, lifted it from church school classrooms into the mainstream. 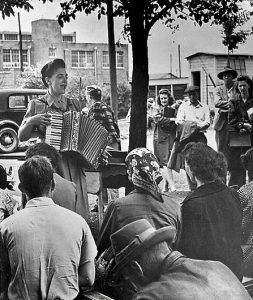 Pete Seeger learned it from Zilphia Horton at the Highlander Folk School. It was the song that sustained voting rights activist Fannie Lou Hamer and others in the Civil Rights movement. 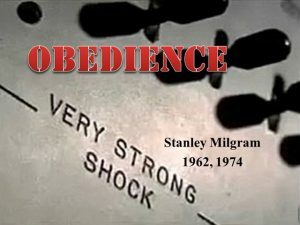 At Yale, in the 1960s, Stanley Milgram conducted a series of experiments on obedience to an authority. Volunteers were instructed to administer an electric shock to a person who incorrectly answered questions. Sadly, almost all of the subjects felt compelled to follow orders, even ones that conflicted with conscience. They kept going, increasing the shocks from “very slight” to “dangerous” (450 volts), despite hearing agonized shrieks from the person (an actor) on the other side of the plexiglass. There was one variation of the experiment, however, that generated a different response. When the subject was flanked by actors who openly objected to the experiment or balked at administering the shocks, the subject was inclined to follow their example. Hearing others object helped them summon the courage to question authority. It’s hard to be brave, stand alone, rock the boat, question authority, interrupt a wrong, be the first to speak up. We fear ridicule, retribution, arrest. Knowing the risks, we justify inaction. But here’s some good news: we can be inspired by each other’s courage. Jesus knew this when he admonished: “Let your light so shine that others may see your good works and glorify God.” The Milgram study variation gave us scientific data to show that we can, indeed, influence others to do good by setting an example. Is there someone in the crowd inspired by our lonely witness? We may never know; we must find the courage to risk doing the right thing anyway. Who’s gonna let their light shine? I am. I am.